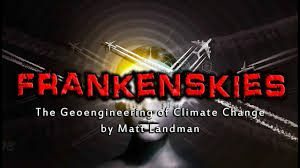 2/7/18 Meria interviews Matt Landman, producer of the excellent film “Frankenskies“. Geo-Engineering since 1923;cognitive dissonance;historical timeline through the years;Agent Orange and Project Popeye in Vietnam;weaponizing the weather; words used instead of chemtrails;Operation Mockingbird;CARE program; combustible trees, alkaline soil;killing off everything;AI,transhuman agenda;5G network dangers; predictive programming; social engineering; dystopian future; kids and frequency devices; new clouds?aluminum/fluoride -Alzheimers;Tucson Conference May 12;Experimenting in Tucson;we do not consent;neurotoxins sprayed;frequency of truth; steering the jet stream;HAARP and much more. True Science Hour with Meria and James McCanney,M.S. 5 Responses to "Meria with Matt Landman -Frankenskies"
I thought this movie was great as well so I had to tune in! Great interview and thank you for throwing your one liner in there about the natural solar dimming that is occurring along with the ice age comment, cheers to the truth 🙂 I look forward to Matt’s sequel as well! thanks, glad you caught that one! Can’t wait for his next film! Amazing show!!! Loved it! Brilliant, Insightful, refreshingly enlightening with facts without being boring. I really hope you have him back again for more shows. Excellent, Excellent, & Excellent! I haven’t seen the movie yet but all his interview jived with what I already knew. I look forward to it. It turned out the “America: A Nation Deceived” https://youtu.be/sly2D8TeH74 has James Fetzer as one of the Consultants. This is the 9 Eleven piece Matt talked about and even though I didn’t get more out of Ole’s last email I think he was able to set up the deal. (So I’m just thinking the wider the network with everyone’s specialities will work for the long haul.) Ole has his vault of research for false flags etc., an excellent presenter and has a wide network of whistle blowers. I have to agree with slkgem about your great one liners and I reiterate that you should consider doing those great paintings stimulating environmental activism! with those one liners and add Matt’s! This is the 60’s come back around and we do all have to show up with our talents. For Matt, maybe someone with good bargaining skills and research the solutions for protections would be a first priority due to the timing of his presentation in May in AZ And I had to laugh a little that you got your own question answered why AZ has been such a target! Right now, I’m not sure which piece I’ll pick up but astrology/healing, health matters (although Dr. John Bergman would be a natural) and/or small scale farming. And I encourage others to begin thinking what they have to offer also. I have also just met a person who combined astrology and Shamanism and gives great invocations for the spiritual piece of bridging the ego with the soul which assists with calming an individual and then to receive imprints from the soul so we can act on this purposely designed shutdown of our Spiritual Awareness/ Consciousness. And for the astro piece we have one great opportunity coming the end of this month through March to get everyone on board i.e allowing others to open to their divine consciousness and fight back. I will as soon as his next film is done. !